Hey Babes! Happy Wednesday! I hope this week has been going swell! I have been getting back into the swing of things at work---with a semi-new job and it's been busy! But, I like it. It makes the day seem to go by quicker! I cannot believe the summer is coming to a close? Where has the time gone? I'll be honest and say that I'm ready for new for fall styles; but, also feel like I have tons of summer stuff to get through! Hahah! Good thing it stays relatively hot in Texas until who knows when! Those boots are amazing. Love this outfit. It'd be fun with skinny boyfriend jeans too! Love the outfit, especially with the boots! It was super, super hot last week in Kansas and then Monday and Tuesday here it's been like fall and today we are back to 100 so it's impossible to know what to expect! You wear your boots so well and they are so darling on you! Love the boots girl! I know what you mean about it staying hot. We can still wear our summer stuff until about October here!! Very cute outfit! I love the boots. Very cute look! Love the ankle boots! 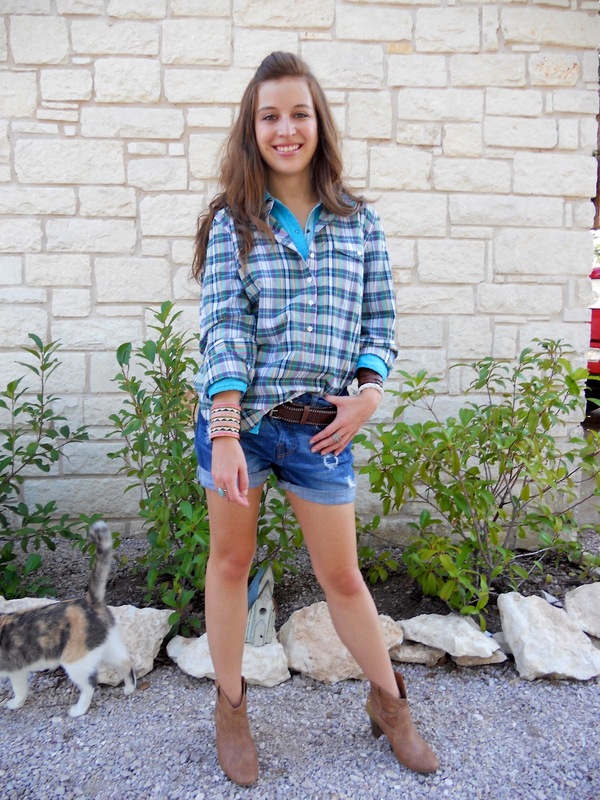 LOVE your DIY cowboy boots! Lovely post dear, you look great! I hope you can stop by sometime, I would love to know what you think :)! that outfit is so cute! what a great plaid and fab boots. Cute! Thanks for stopping by the blog! Come back and visit soon!! 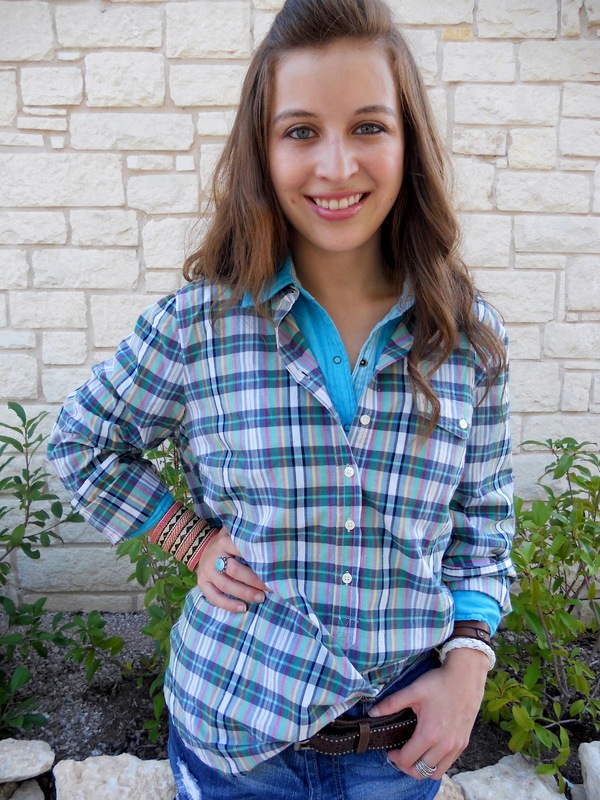 You look adorable, I love the plaid shirt and the fab DIY boots dear! Wishing you a lovely week. Totally agree - I'm so ready for fall clothes! Great boots! I'm loving booties right now! And yours with the glitter...amazing! You are so cute in this Western wear! I agree with busy days, I'd rather have a busy day than a slow day! Love your boots! You are beautiful and stylish! yep i agree, it's great when you are busy and then you get a day off, that day off feels so well deserved! Great outfit! Love the boots! very cute outfit! nice boots! Okay, this is one of my favorite looks of yours:) It just seems to fit your age. I LOVE it all!!! Howdy hottie! Haha! Very cute. And I love that tribal cuff bracelet! I really wish I could pull off the ankle boot look! I think I probably could, but I live in a teeny small town and I'm pretty sure everyone would look at me funny! I was at TJ Maxx earlier this week and saw some that were probably pretty cheap (love TJMaxx prices!) maybe I'll go back and try them!